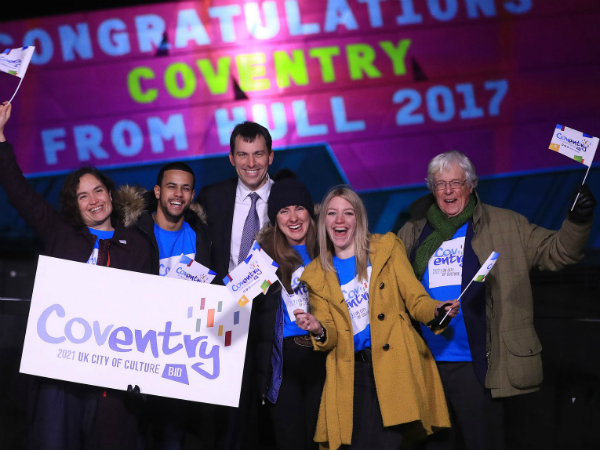 Coventry will host the prestigious title of UK City of Culture 2021, Arts Minister John Glen announced yesterday. The bid impressed the judges with its focus on youth, diversity and the scale of impact not only in Coventry but across the UK as a whole. In 2017 I have seen the truly transformative effect this prestigious title has had on Hull. The city has embraced City of Culture and in doing so has demonstrated how culture, the arts and heritage can bring communities together. I look forward to seeing what Coventry has in store in 2021. Once again the process has highlighted the depth and strength of culture across the UK. That made it difficult choosing a winner, but I would like to congratulate Coventry and I am sure they will build on the legacy of Derry-Londonderry and Hull and bring about a transformational change in 2021. For those that weren’t successful this time, I hope, as has happened in other places, that they will look to the future and build on the wider cultural partnerships they have created. Watch the video below to see how JLR played a part in helping Coventry, the city of our Whitley HQ, win the title.